The venerable Jaguar XJ is 50 years old, and what a life it’s had. Cloaked in the veil of dubious British opulence for most of its life, it’s hard to say that its had the easiest time in this world, but it sure has had quite an impact on the world. From being the car of choice of many British government agents, on and off the silver screen, to being the choice of the rich people who just want to stand out, the XJ has definitely made its mark over these past 50 years. I think that warrants a look back at its origins, don’t you think? When building the first XJ, Jaguar had taken a huge notice to how the rest of the world was doing luxury at the time, and decided that it was their turn to take a hit at the concept while doing it their own, special way. The last car to bear the approval of Jaguar founder Sir William Lyons, it was penned to the public as, “the finest Jaguar ever made,” replacing nearly every one of Jaguar’s sedans at the time with a completely new look for the company that showcased its racing heritage with utmost elegance. Upon debut, the XJ was originally only fitted with Jaguar’s inline-6 in a short wheelbase model. Under the skin, it featured a various treasure trove of suspension work featured in other Jaguar models, such as the independent rear suspension found in the Mark X as well as front suspension systems borrowed from the ancient 2.4-litre from Jaguar’s past. In 1972, a long-wheelbase version was introduced, along with a V12 model, dubbed the XJ12 which spearheaded the XJ into its next iteration in life. All things considered, it could be noted that the Series II XJ is probably the lowest point in the XJ’s life. When the Series II was introduced in 1973, Jaguar had just been acquired by British Leyland, and if you know British Leyland, then you know where this story is headed. Most of the architecture of the XJ was largely unchanged from the Series I, with only minor outside appearance changes made. The car unfortunately suffered from electrical components of questionable quality as well as iffy build quality due to British Leyland struggles during the time, hence a huge amount of customer complaint. 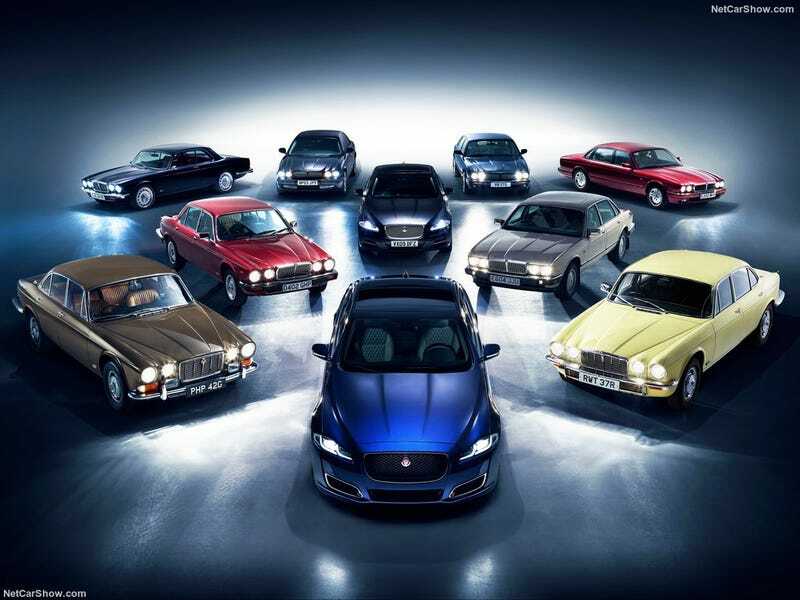 It was during this time, however, that Jaguar introduced a coupe model of the XJ in 1975, in response to the growing market of full-size luxury coupes in the world. While basically a two-door XJ, it featured pillar-less windows and a vinyl roof, setting it apart in minor ways from its saloon counterpart. There was a slew of difficulties that surrounded the XJC from its debut, however, such as quality issues and economic downfall, that prevented the car from selling initially. Jaguar did manage to get the car on the market, but not for long, as it was soon replaced by the XJS coupe in 1978. The XJ was updated yet again in 1979 with an all-new look on the exterior, but still with little change on the suspension. Gone were the long-wheelbase and coupe variants, leaving one handsome sedan from which to build an empire. Engines were largely the same as well, two types of inline sixes and a V12, with the V12 receiving minor work in 1981 to become, “High-Efficiency,” engines. The Series III was the first XJ where great care was taken to pander to outside of the United Kingdom with certain new models and features introduced. Jaguar presented a new high-end model known as the Vanden Plas for the US market, a name formerly only found on the bespoke Daimler models that were built from XJs, as well as a final 100-car range built for Canada in 1992 near the end of the Series III line. For the longest time, Jaguar had known that they couldn’t live off of the original XJ forever. Early design work had been done on a replacement as early as 1972, but issues in the economy and at British Leyland had prevented the work on the car for almost a decade, leaving the future of the XJ hanging in the balance. When Jaguar finally got a chance to begin working, they sought to immediately improve and evolve the production process for the new car to create an simpler XJ with more sound quality and less issues in the future. When the new XJ40 car was introduced, it was sold alongside the Series III XJ12, which meant that until 1993, the only engine available for the XJ was an inline-6, leading to the dubbing of XJ6 for some markets. Four sixes were available, mated to a slew of 4-speed automatics and 5-speed manuals for most of the run. The XJ40 was also host to a list of new technological advancements, such as an all new iteration of the Jaguar IRS system and an electronic gauge cluster, a first for Jaguar. The XJ40 was also the first generation to feature a high-performance model, the first XJR. Built by JaguarSport as a joint-venture between Jaguar and TWR racing team, the XJR featured unique Bilstein dampers, a revised power-steering valve for heavier steering input, and exterior touches. Power initially was delivered by a standard 3.6L Jaguar six, but was later replaced by a TWR-tuned 4.0L unit with new inlet manifolds, uprated cams and a tweaked ECU creating more power. By 1994, Jaguar had been purchased in full by the Ford Motor Company, who sought to introduce a completely new era for British manufacturing, with Jaguar, Aston Martin, and soon Land Rover as the spearhead for the movement. However, the newest generation of XJ under their ownership was nothing more than a huge overhaul of the existing XJ40 model. It featured new exterior styling that was far more curvaceous than previous offerings, which showcased the future design philosophy of the Jaguar line. Engine choices were largely unchanged, with the V12 models featuring a new management system sourced from Denso, sought out by Ford’s ownership. Ford’s influence in the creation of the X300 lauded heavily, as some owners and critics found issue with the, “Ford parts-bin build quality,” they had found, which was felt as very becoming of the future of Jaguar. Nevertheless, a total of 92,000 X300s were built by the end of its production in 1997. The X300 XJR was a humongous departure from the model which came before. Its engine’s output had been increased to 326 horsepower thanks to an all-new Eaton supercharger. 0-60 was clocked under 6 seconds, which was one of the fastest Jaguars at the time, only beaten by the XJ220 supercar. The XJR’s power was transferred to the rear wheels through either a Getrag 5-speed manual, though most cars were sold with a GM 4-speed automatic. Three years after the X300's introduction, Jaguar introduced the next generation of XJ, dubbed the X308. The design was mostly unchanged from the X300, with minor upgrades made here and there for the sake of difference, but Jaguar and parent company Ford had made changes under the skin in response to some of the complaints held by X300 owners. The biggest change for the time was the discontinuation of the Jaguar inline 6 on all models, replaced by Jaguar’s all-new AJ series V8. This lead to a more refined feeling car with an engine that put it more in line with competitors that also had largely begun to use V8s, and also provided a power boost, especially to the performance-oriented XJR, which boasted a 0-60 time of 5 seconds flat. Ford and Jaguar also made it a huge importance to hide any sort of Ford influence inside and out, including an all-new redesigned interior that featured less plastic buttons and more leather and wood where it counts. The X308 was the first XJ introduced without a manual gearbox, with 5-speed automatics being used throughout the line. Under the skin, the X308 used Jaguar’s new CATS suspension system to provide a more comfortable, yet firm ride when it was really necessary. The X350 marked the first huge refresh to the XJ since the XJ40's introduction in 1986, featuring a completely re-worked image inside and out. The bodywork was a new aluminium monocoque made from self-piercing rivets. This innovation lead to the lightest generation of XJ produced at that point, with an overall curb weight equal to that of a modern Mini hatch, a mindblowing achievement for the time. The components of Jaguar’s independent suspension were revised once again with a new multi-link system being adapted with all-around air suspension being put in place. Upon introduction, the X350 carried over its V8-only line from its predecessor, but it was soon joined with two new six-cylinder diesel units as early as 2005. These new diesel units were focused on fuel economy as well as a smooth-running architecture, with electronically controlled engine mounts to reduce vibration at idle. The X350 XJR also featured a supercharged V8 similar to its predecessor, pushing 400 horsepower to its wheels through a 6-speed automatic, an XJ first. However, the XJR was not alone in the use of this supercharged V8, as Jaguar soon usurped the XJR as the most expensive Jaguar model with the addition of the Super V8 and Super V8 Portfolio models. These models were designed to showcase the highest luxuries that Jaguar were able to fit onto the cars, designed to compete with competitors such as the Mercedes-Benz S55 AMG and Audi S8. In 2007, Jaguar introduced a refreshed variant of the X350, dubbed X358. It featured a more modern monochrome look with the addition of updated headlights and LED turn signals, a more aggressive front fascia, and side vents added to the front fenders. The interior was also slightly changed with upgraded seats for added comfort. Performance as a whole was largely unchanged. In 2009, Jaguar introduced the latest version of the XJ, dubbed the X351. The newest XJ showcases the largest departure from the tradition of the XJ, dropping the classic saloon look of the original and going for a sleeker, sexier fastback sedan style, similar to its smaller sibling, the XF. The car’s mechanicals share a lot with the X350 model, with some minor changes in certain areas to keep it modern for the most part. Where the biggest changes were made apart from the design are under the hood, where buyers get a choice of one diesel V6 and three V8s, with two supercharged variants offered for the higher end models. The X351 features a lightweight aluminum floorpan, steel coil springs in the front suspension, and continuously variable dampeners in the suspension, with only air suspension being found in the rear. Just as its predecessor, in its base form, the XJ is one of the lighter full-size luxury sedans on the market. For 50 years, the XJ has seen itself face the toughest trials and tribulations of the changing times in the automotive luxury world. It was never the best selling car in its market, or even the most forward-thinking, but it was definitely the most unique, which just adds to its overall aura. It’s a car that’s chauffeured everyone from royalty to the most unique businessmen, it’s a car whose owner knows exactly what they’re looking for, and that’s why I tip my hat at every single one I see. So, here’s to the XJ...you’ve aged gracefully for 50 years, and I see another 50 in you.